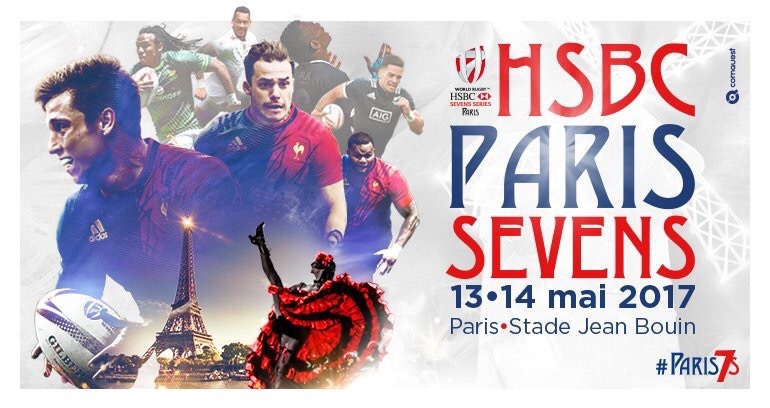 As the rugby world focused on Edinburgh this weekend, the 16th arondissment that leafy Parisian suburb around Porte de Saint Cloud, played host to the penultimate leg of the HSBC World Sevens Series. 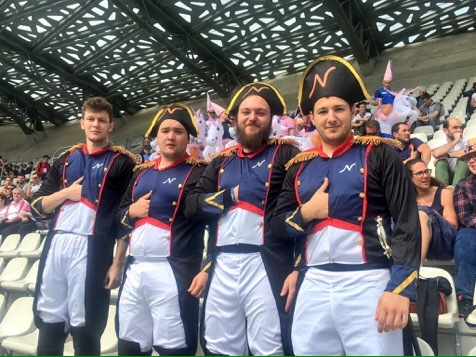 Paris needs no excuse to party, and at the home of European challenge cup winners Stade Francais, Stade Jean Bouin witnessed two days of music, food,drink and top class rugby that ticked all the boxes of a great sporting and social weekend. The thumping kenyan drum band just came out on top against my rather feeble paracetamol intake, but the headaches were worthwhile. What the opposing French band lacked in volume they more than made up for in tempo their dubious choice of music underlined as a Gary Glitter hit rocked the stadium at various intervals. 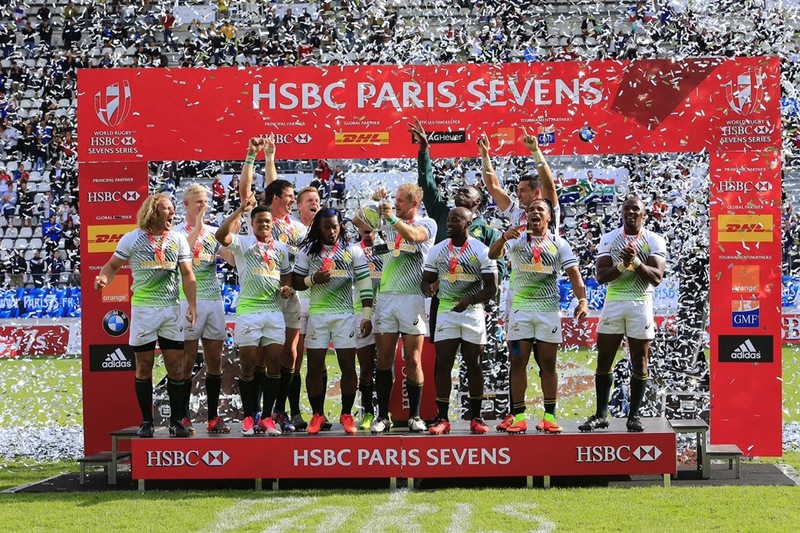 Of course sevens is about more than rugby, and in the capital of fashion the fancy dress, that is now part and parcel of the sevens circuit, if not exactly Christian Dior was certainly worthy of Christian Califano. When told that my 70s costume was brilliant it was somewhat embarrassing to state that I hadn’t in fact come in fancy dress, and that I worked for the media Zut Alors ! A largely partisan French crowd came to life when les Bleus took the field, and if their team did not really gel at the weekend one sumptuous offload from Vakatawa was worth the admission fee alone. The photo in Sunday’s L’equipe does not do justice to the beauty of that one act, it would need a painting by one of the French impressionists to truly convey the sheer uplifting joy of the pass, which Vakatawa followed up himself to score a try that created such a roar causing the coffee cups to rattle as far away as the Gare du Nord. My Monday roar was almost hijacked by a lovely bottle of Merlot last night but ever the proffesional I managed to assume some self control just in the nick of time. The nuts and bolts of this tournament are that South Africa won it and won the trophy, but the cold statistics are somewhat secondary. Having been a bit sniffy about sevens, I will never forget the sheer joy and comraderery of the fans ,the smiles On the children’s faces as they clutched their freebies from the sponsors, the rugby themed games in the tournament village and the local coaches playing with the kids, and showing how much fun can be had in this great game. It was more like a recruitment and open day for the sport of rugby, and I promise I will sniff no more, because the joy on show was genuine and overwhelming and I left that leafy Parisian suburb uplifted and desperately wanting to go for a kick about in the parc.